Intermatic FF Series Commercial spring wound countdown timer with 4-hr time range, has voltage rating of 125 - 277-Volt AC at 50/60-Hz and current rating of 10-Amps at 250/277-Volt AC or 20-Amps at 125-Volt AC. This timer with SPDT contact configuration, has a dimension of 1.75-Inch x 1.25-Inch x 4.125-Inch. It has contact rating of 10-Amps at 250/277-Volt AC, 20-Amps at 125-Volt AC and 7-Amps at 125-Volt AC for tungsten. This silver colored timer with a plastic knob/aluminum plate, has a maximum load rating of 1 hp motor at 125-Volt AC and 2 hp motor at 250-Volt AC. 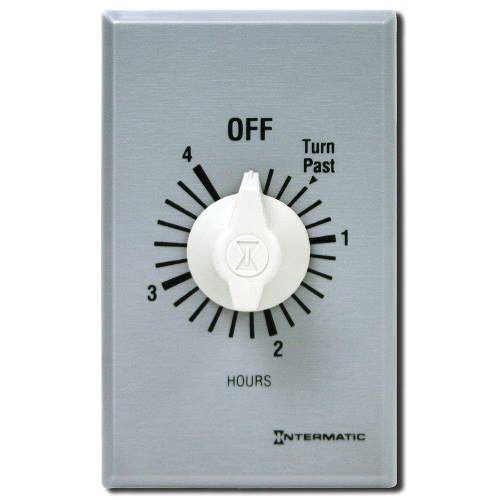 It supports wall mounting and has temperature rating of 32 to 104 deg F. This brushed metal finished timer is great for hot tubs, storage closets, garage lights, air conditioning and appliance. Timer is UL listed, cSAus certified and UR recognized.